Last spring and summer, a group of poh-pohs (Cantonese for “grandmothers “or “elderly women”) gathered every Saturday to grow fresh vegetables in raised beds and pots on the edge of the parking lot at East Hastings Street and Jackson Avenue. Led by local organizer Doris Chow with support from the Downtown Eastside Neighbourhood House and Carnegie Community Centre, this Chinese Seniors Community Garden became a new space for seniors to share skills and stay healthy. Group photo of the gardening poh-pohs. Photo by Clare Yow. In Fall 2018, the Sun Wah Centre on Keefer Street hosted CHINATOWN GENERATIONS as part of the Heart of the City Festival. This intergenerational community event celebrated Chinatown and its ongoing presence of cultural heritage. It featured a photo exhibition by and of urban farming poh-pohs and their gardening activities in the Downtown Eastside. During this event, an attentive audience listened to these seniors share stories from their experiences in this project with the support of English translators. Unlike many other community garden spaces, these elderly Chinese women tended to the garden beds in a communal fashion and shared the harvest. In addition to obtaining produce and new garden skills, they cultivated stronger friendships and community with one another. Upon my arrival to the event, one of the senior participants, Kong Tai (Mrs. Kong) came over to say hello and handed me a small photo album. Mrs. Kong is a well-known elder in the Chinatown community who advocates on issues of housing justice. Despite the language barrier between us, the photos she offered me conveyed her excitement and happiness for the garden project. Photos taken by the seniors exhibited at the Sun Wah building for the Heart of the City Festival. Photo by Clare Yow. As I flipped through the photo album, the 4×6 prints displayed the unmistakable film aesthetic of a disposable camera. I realized these photos were taken by the poh pohs themselves. The photos captured many bright faces, green growth, and blurred smiles: Mrs. Kong and her friends working in the garden, a group of elderly women displaying large bunches of Asian greens, a harvest of juicy mo gwa (fuzzy melons). These photos captured the seniors’ experiences through their own lens. While the Chinese Seniors Community Garden project is joyful, it is also critically important. With increasing gentrification in Chinatown, 55% of grocery stores have closed down or moved out of the neighbourhood within the past decade (according to a report by hua foundation). We had all the grocery stores and herbal stores, cafes, a variety of restaurants to eat dim sum or dinner, which are important social spaces for us Chinese people… [but] there are not even a lot of grocery shops left. A big problem is that the new places opening in Chinatown are either a coffee shop or a nightclub. These places are really expensive and they don’t sell things that we need, nor are they welcoming spaces for us. They are unsuitable to our needs. I never go into these places and I drink my coffee at the Carnegie. No one needs expensive coffee or skateboards, but we need groceries. Guests view the exhibit at Sun Wah. Photo by Clare Yow. Beyond the needs of the Chinatown neighbourhood, increasing numbers of seniors are unable to afford to feed themselves. In December, CBC reported that approximately 10,000 seniors—a figure on the rise—access the food bank each month in B.C. As life expectancy increases, food insecurity for seniors is expected to worsen, too. For seniors who live in poverty, B.C.’s disability and welfare rates do not support them to afford healthy foods. Nearly a third of seniors are deemed “at risk” of not getting adequate nutrition from their diets according to Statistics Canada. At the intersection of age, class, gender, and race, many elderly Chinese women experience discrimination while navigating social services. For years, service providers in the Downtown Eastside have recognized the need for more culturally-specific services for Chinese seniors. The success of the Chinese Seniors Community Garden is even more meaningful with an understanding of how immigrant seniors’ needs are not adequately met by Western society. The role of friendship and community in this neighbourhood are necessary for survival. Growing gardens may be the vehicle, but this multi-lingual, culturally-focussed project will have lasting impacts through its built relationships. As the gardening season begins again, more local food security projects are continuing to center the needs of seniors in other parts of the city. In the coming months, Little Mountain Neighbourhood House will launch “Sowing the Seeds of Inclusivity,” a gardening project at Riley Park Community Garden to specifically support food security for seniors in Little Mountain-Riley Park neighbourhood. In addition to gardening and cooking activities, the project will provide lunches in the garden and shuttle rides to and from the sessions, as a means of increasing accessibility. For those who are looking to get involved or are passionate about seniors’ food security, Riley Park Community Garden is currently looking for new members to join their Seniors Engagement Committee for their “Sowing the Seeds of Inclusivity” project. The Chinese Seniors Community Garden is also welcoming new volunteers and gardeners, with no prior experience needed. They will host a public re-opening celebration on Saturday, April 20, 2019 at 10AM. The group will celebrate the new growing season with snacks and an official lion dance opening. The Chinese Seniors Garden will re-open on Saturday, April 20, 2019 with a community celebration. Everyone is welcome to attend. As the food movement shifts to prioritize more and more underrepresented voices, like those of our elders, I hope we will continue to listen to elders’ stories and learn from the wisdom they have to offer. I hope projects like the Chinese seniors garden plant the seed for more of Vancouver’s food communities to address seniors’ specific needs to access healthy, affordable, and culturally appropriate foods with dignity and respect. Congratulations to all the poh-poh participants and project facilitator Doris Chow. This project has been supported by the Downtown Eastside Neighbourhood House, Carnegie Community Centre, New Horizons for Seniors, and Wing Wing Sausage Co. Limited. Thank you to Clare Yow for permission to use your photos. With the rising cost of food, housing and overall living, the issue of addressing hunger requires a multi-dimensional approach. It does not exist on its own. The latest Food Costing in BC report highlights the increasing cost of food. Produced by the BC Centre for Disease Control and Provincial Health Services Authority, this report breaks down the cost of a nutritionally adequate diet. Not surprisingly, food costs have been increasing by over 4% on average since 2015. The average monthly cost for a family of four in Vancouver is estimated at $1,098. Vancouver Neighbourhood Food Networks participated in this year’s Wild Salmon Caravan parade on Saturday, September 22, 2018. This is an annual event organized by the Working Group for Indigenous Food Sovereignty in partnership with over 100 local organizations from Vancouver through Chase, B.C. It is also the kick off event for Sustenance Festival, a local community-based food, art, and culture festival. The Wild Salmon Caravan festivities began in downtown Vancouver, or what is known as Xwenelmexw on unceded Coast Salish territories. Hundreds of people gathered in the streets to celebrate the beauty and resilience of wild salmon as an Indigenous food source, and a significant cultural and ecological keystone species. Chants of “Wild Salmon Forever!” were accompanied by colourful costumes, mermaid tails, mythical sea creatures, parade floats, bike floats, banners, and artful decor with an homage to wild salmon. The fourth annual Wild Salmon Caravan Parade is happening in Vancouver this weekend. You’re invited to join in the celebration! Wild Salmon Caravan is an annual celebration that celebrates wild salmon and follows their journey as they migrate from the Salish Sea to the Adams River in Chase, BC. 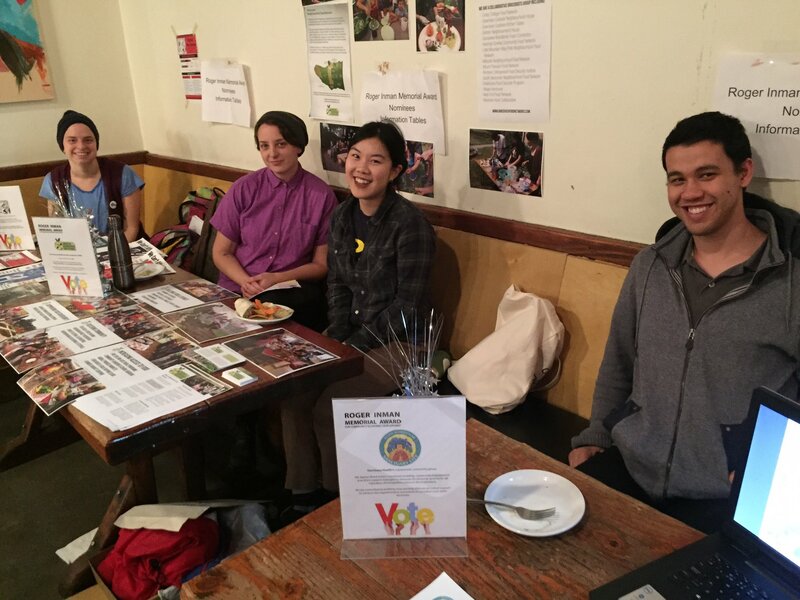 Our local Neighbourhood Food Networks are doing amazing work all across the city! This month, check out the work that our local Neighbourhood Food Network Renfrew Collingwood Food Security Institute is doing around themes of migrant + food justice and celebration. Join our local Neighbourhood Food Network Renfrew Collingwood Food Security Institute for a film screening of MIGRANT DREAMS, a powerful documentary on Canada’s Temporary Foreign Worker Program.